Here’s a Contextual Link to the Country information about Kyrgyzstan. Pile rug weaving in Kyrgyzstan has been done by women in their homes, primarily in the south of Kyrgyzstan. 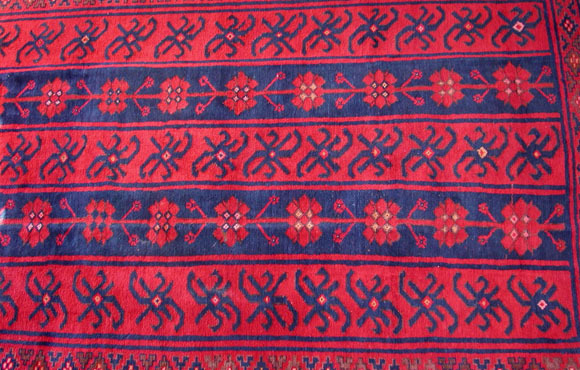 The Kyrgyz rugs we have in our shop were woven in the early and mid parts of the 20th century. A combination of natural and synthetic dyes were used. The colors are usually red and navy blue, and the designs are creative and varied. To learn more about Kyrgyzstan visit our Carpet Country profile page about Kyrgyzstan.